Make today great. Do something fun. Get out and see the world. Whatever you do today, make sure you are wearing a smile. Go out an enjoy the weather, after all it is the first day of Spring. Happy Spring! 97 years ago today, five incredibly determined and forward thinking young women founded an organization that continues to strive for the equality, innovation and empowerment of women! Today, I celebrate every sister past, present and future. Today, I thank you for your impact, contribution and dedication! 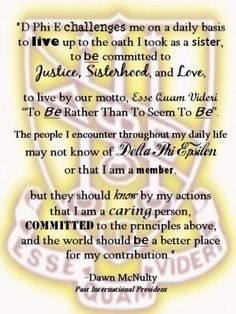 Today, Delta Phi Epsilon celebrate their Founders. I’m lucky enough to be one of those women paying homage to the founding ladies of DPhiE. Today, we hope that you take a moment to honor those sisters who have come before us and the future sisters who will be carrying on our traditions. This morning I woke up to an email from the one and only, Ann Marie (that’s my mom!). She wrote email that was simple, sweet and to the point. She sent it to Joel, Lauren and me (that’s my fam). The e-mail read: This really makes your heart happy! Enjoy your day everyone and know you are loved! After reading this email I was very intrigued by what was in the link. Watch this video and you will understand. Life is filled with simple joys. They are joys that we cannot explain and that’s okay. You will encounter these simplicities and all you can do is smile, so smile. Stop what you are doing and just take it all in. We need a slow-down in our daily lives. We get so caught up in life, that we don’t see that the little things are what is most important. Like Ann Marie said, know you are loved and enjoy your day.